This annual event is held to honor the memory of our loved ones and offers a 10K, 5K run & 2 mile walk & Kids K. Come join us on Memorial Day. 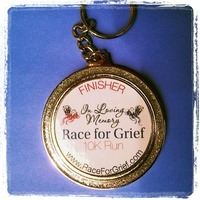 See www.RaceForGrief.com to learn more. A coached group training program is available for those interested in coaching. (Additional fees). Contact Coach Lora Erickson at theblonderunner@gmail.com to learn more.